This is the second week of Reading Countdown to The Anthony Awards at Bouchercon 2016. Now there are 14 weeks until the Anthony Awards are presented on Friday, September 16, 2016. This week I suggest you read the second nominee alphabetically in the Best Paperback Original category, Adrian McKinty's Gun Street Girl: A Detective Sean Duffy Novel. 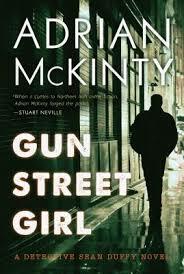 Adrian McKinty's literary Northern Irish crime fiction novel GUN STREET GIRL was published by Seventh Street Books on March 3, 2015. The novel was shortlisted for the 2016 Edgar Awards, the 2015 Ned Kelly Awards, and the 2015 Audie Award. The Detective Sean Duffy novels are set in Belfast in the 1980's during "The Troubles." Sean McDuffy is a Catholic police detective in a predominantly Protestant area. McKinty's Duffy novels are renowned for being both dark and witty. McKinty has a gift for using the police procedural to examine the larger historical and societal issues at play. GUN STREET GIRL is the fourth in the series. The fifth RAIN DOGS is on the longlist for the 2016 Theakstons Old Peculier Crime Novel Of The Year and on the longlist for the CWA Ian Fleming Steel Dagger Award 2016. You can order a copy of GUN STREET GIRL here with these links for IndieBound, Amazon, Barnes & Noble or purchase it at your local independent bookstore.